This is why POP-DOC.com is here. This is why POP-DOC.com was created. It is a place where you can take responsibility for the health and adequate function of your joints. This is where you, potentially, can get back that near-pain-free function, so you can do the things you want to in society and in life. Thinking positively about a painful joint may help coax the joint back to a pain-free existence. Your thoughts may encourage your body to react to injury and pain more efficiently. There is more and more evidence-based information that concludes positive thinking can help get rid of pain and facilitate healing. Many pain specialists and neurologists try and incorporate these positive thinking measures to help heal or deal with pain. The power of thinking positively in cancer patients has been the topic of much discussion. Some articles or published works state that in some instances positive thinking can help put cancer into remission. So the painful joint may make you have to alter the voluntary activities in your life, but it may not be forever. Thinking positively that your painful joint will heal some day can help you deal with what that means. It may mean staying home from work for 2-4 weeks if your work is very demanding, staying off the playing field for a few weeks, skipping your normal workout routine for a few weeks, or holding back for a bit until the joint feels better. It surely beats thinking that your painful joint will permanently keep you from the activities that bring you energy and happiness. Simply stop what you are doing (use the other arm and leg for most of the work) and take it easy. Sit down, relax, and limit your activities. The more motion there is in an injured, painful joint, the more blood will flow there. This can lead to increased swelling, especially in an acute situation (an injury that just occurred and causes you pain). Rest will allow the area to calm down and hopefully feel less painful. Keep the painful joint above the heart. This will allow the fluid build-up, from within and around the joint, to leave the joint area and return to the body. Swelling is the term given to the changes to soft tissue and/or joint that occur when excess fluid enters the area. The swelling occurs due to the release of fluid into injured, overused, or damaged joints or soft tissues. Excess fluid around joints makes them stiff. Elevating the painful joint brings the fluid back towards the heart, because the fluid will be carried to and from the joint by the blood vessels. The arteries bring blood and the veins take blood away from the extremities. People perceive pain differently within their brains, and they experience different phases of it at different times. A pain-scale rating of 10 for one person could be a 4 for another. Pain resolves at different rates for different people. Some people who do not feel they need pills and tablets can ease their pain through thinking about something else. The power of the mind can alter the perception of pain. The nerves within the inflamed soft tissues around joints send signals to your brain to give the sensation that there is pain and then your brain "feels" it. Pain medication does not speed the healing of soft tissue inflammation or injury but rather it dulls the symptoms of pain. In addition, some pain medication may affect the body's organs and others may bring about addiction. Pain medication should be used sparingly. Use all medication only as directed. Anti-inflammatory medications have been shown to diminish inflammation around damaged tissue. They will not alter the rate of tissue healing. Anti-inflammatory medication can allow for less fluid buildup within the injured/painful joint. With judicious, short-term usage, these types of medication at times can bring the joint back to a normal size and allow it to achieve full motion more quickly than without the use of anti-inflammatory medication. Excessive usage and/or taking pain/anti-inflammatory medication without food can lead to stomach problems or other bodily dysfunctions. Use all medication only as directed. These medications should not be used for more than several days and the risks of bleeding and/or organ toxicity must be mentioned and understood. Putting pressure across the injured/swollen/painful joint can help get the joint back to working, pain-free order. Compression squeezes the joint slightly to prevent the excess fluid from finding its way into the joint or soft tissues around the joint. In addition, compression can gently squeeze excess fluid out of a joint or from the soft tissues around a joint. Compression should be firm but not too much. The pressure has to be enough to resist and/or prevent the fluids from entering the joint. The compression should not cause or increase any pain or feelings of numbness or tingling to the hands or feet. These types of products may be helpful when someone has a painful joint. They can be creams, gels, ointments, sprays, liquids, and/or powders. The application of these topical products is performed after icing and drying the skin overlying the joint (each have different instructions on how much or how often, but it is not recommended to use very much of the topical at one time). The concept is that some topical products can penetrate the skin cells and/or alter the sensation that the skin is "feeling". These will penetrate the skin and just below the skin. There are topical products that can alter the sensation of pain, or give a perception of coolness or heat around the skin over a painful joint or area. There are some topical products that have anti-inflammatory properties. 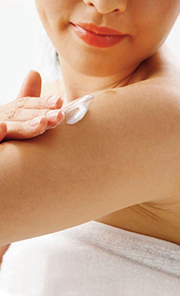 However, the topical products do not travel around the body as much as a pill does. These types of topical products may alleviate swelling and inflammation around the pain joint. The risks of the products include burns, so these are used solely at your discretion. Ice has been shown to diminish the inflammatory mediators and to physically cool the skin and soft tissues around the painful joint. The inflammatory mediators are the molecules that tell the blood vessels to bring in more "healing" or "inflammatory" fluid to the joint or tissues around the joint. These substances send signals to nerves to make them perceive pain in your brain. These substances are partially responsible for increasing the fluid within the joint. 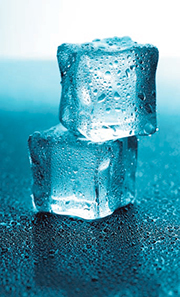 Ice has been shown to cool the heat created by inflammation, as well as diminish some level of pain. Basically, if it hurts, do not use it. This may mean that you should carry your purse, luggage, or brief case on the other side. It may mean holding off from playing your weekly sporting activity until you feel better. This may last for four to six weeks. Maybe it will mean that you use the computer mouse with your other hand for a period of time. You may need to try and sleep on the other side, put your coat and/or clothes on differently, or carry shopping bags in your other hand. This will permit you to stay active in society and in the work place, but will also limit the use of the injured joint until it feels better. This is your chance to get your joint to function in a near-pain-free manner in your activities of daily life and your endeavors in life. Once the pain and inflammation start to subside, it is time to gently begin an exercise regimen to bring the painful joint back to function. These include range of motion, flexibility, strength, and endurance exercises, as well as balance and proprioceptive activities. An exercise regimen may help prevent injury in spontaneously arising scenarios: stepping on an uneven sidewalk, tripping off an uneven curb, slipping on ice, carrying one too many bags while on vacation, carrying one too many children as they are screaming past their bedtime, squatting on the floor for one too many hours with your children, squatting in the garden one too many hours with your vegetables, shoveling one too many shovelfuls of snow, hammering in one too many nails in your weekend project, raking one too many leaves on a blustery fall morning, skiing that last run when you are too tired and falling, playing that last set of tennis when you knew you were on your last legs, sliding into second base just to beat that throw, diving for the touchdown pass in your weekend game, and/or pumping that last set of weights when you knew you should have taken 10 pounds off. These are the activities that bring about pain and these are the activities that you want to do, so you can enjoy your life and be able to perform your work without limitations.